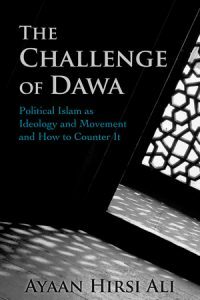 “Dawa is to the Islamists of today what the ‘long march through the institutions’ was to twentieth-century Marxists,” writes Ayaan Hirsi Ali in her latest monograph, The Challenge of Dawa: Political Islam as Ideology and Movement and How to Counter It. In it the Somali-born political activist accurately analyzes the threat of, and necessary response to, Islam’s faith-based political ideology, yet the feasibility of her desire to reform this “Islamism” out of Islam is questionable. Ali sees positive indications that President Donald Trump is taking a “more comprehensive approach” to “defeat political Islam (or Islamism)” and offers her own proposals for this strategy. Among other measures, public diplomacy entities like Voice of America should “fight the war of ideas by disseminating a counter-dawa message.” The United States also should also apply “ideological scrutiny” to immigrants, refugees, and military chaplains. Forty or fifty years ago, it was still widely believed that the migration of Muslims to Europe, whether as ‘guest workers,’ immigrants, or refugees, would lead to their secularization and assimilation. Americans who assume that this will happen in the United States should take note that the opposite has happened. European Muslims are not the only disappointment for Ali’s Muslim reformer allies like former Wall Street Journal reporter Asra Nomani, with whom Ali jointly testified before the Senate on June 14. She has joined with like-minded Muslims worldwide such as Zuhdi Jasser, who makes in his longstanding “Battle for the Soul of Islam” precisely Ali’s same distinction between Islam and Islamism. Yet their Muslim Reform Movement has suffered sobering setbacks in America. Several logical reasons explain why the Muslim reform failures of Ali et al. are not surprising. Whatever moral inclinations Muslims might have, her Mecca/Medina distinction demands that Muslims somehow eschew Muhammad’s political practice while still viewing him as a religious authority. Yet as the example of Jews and Christians show, over time mainly orthodox are faithful to religions, not people who split differences over prophetic examples. By contrast, the liberal spirit advocated by Ali could very well lead freethinkers like her not to orthodoxy, but rather to her atheism or another belief system like Christianity, particularly in light of Islam’s numerous legalisms. She strives to separate Islamic politics and piety, yet certainly many remain within Islam’s fold not out of sincere conviction, but coercion. Even in “moderate” Indonesia, Islamic repression exists in the form of blasphemy laws. Ali at her Senate testimony raised eyebrows when she ominously described the Netherlands’ second largest party as a “radical right wing group.” As knowledgeable observers like this author in the hearing room instantly recognized, she was anonymously referencing the Freedom Party of Geert Wilders. While she has many sound policy proposals, time will tell who is more radical, Ali or Wilders, a strident critic of Islam who has personally explained to this author severe doubts concerning Islam’s reform. To purchase her autobiography, click here.